Hinckley Yachts make some of the most beautiful boats in the world. Their workshop is located right next the the street in Manset, Maine. I always enjoy passing by their buildings since you never know what you'll see. This beautiful sailboat was being pulled from the harbor to have work done on it. 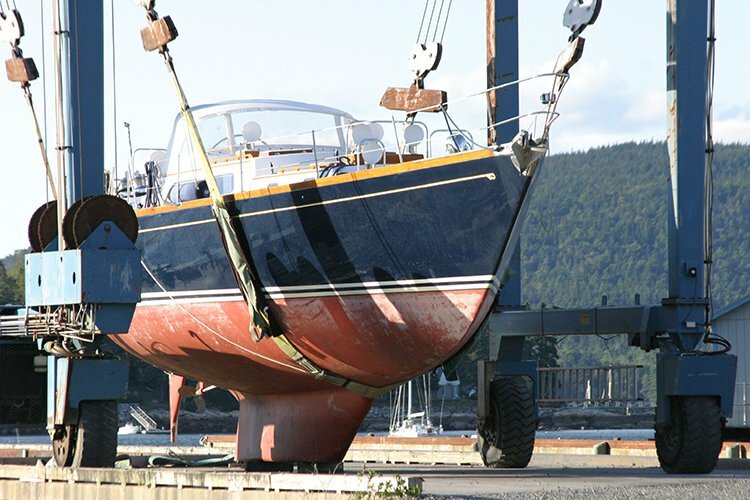 The massive girders cradling the sailboat is quite a sight to see! 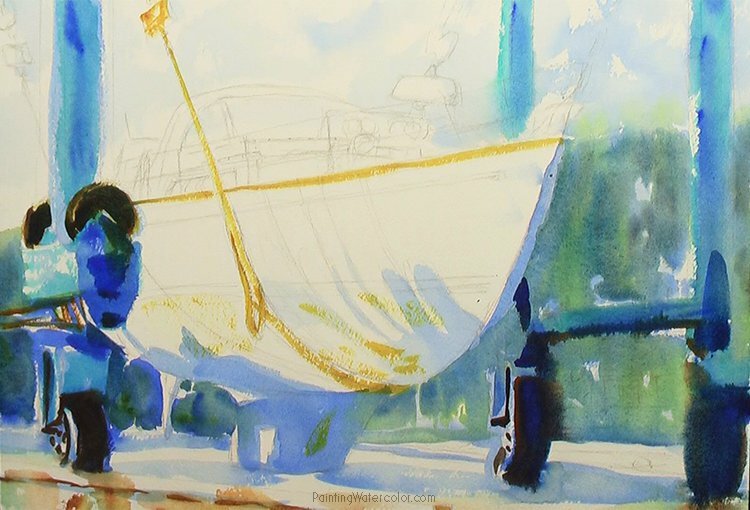 This is a very simple painting with the focus on the light on the sailboat's hull. It's interesting how this massive boat looks almost delicate when held in its sling. Something about the perfect lines makes it seem much smaller than it really is next to the huge steel beams. The color almost glows, even though it's a very simple palette. There's also a lot of texture, so I went with the happy medium of cold press paper. It's a beautiful sailboat on a late summer Maine day! Draw your sailboat carefully. 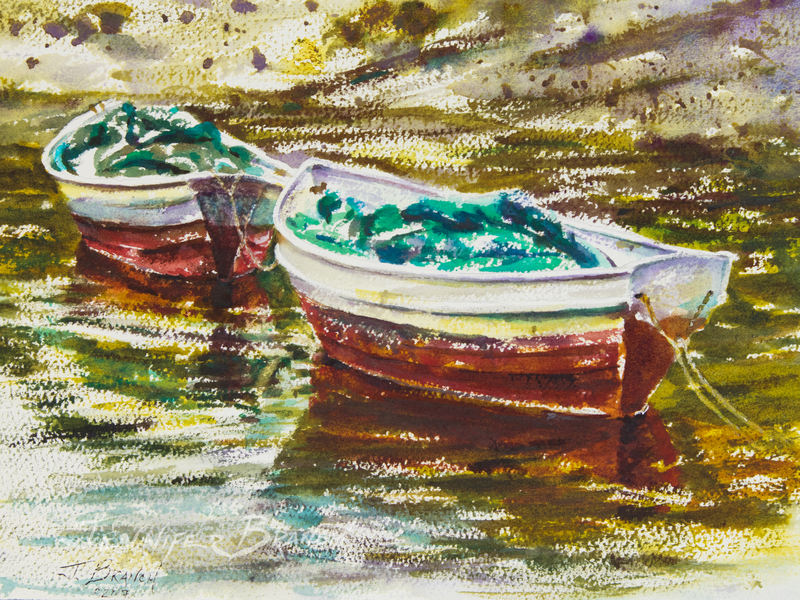 This is a relatively loose painting, but a sailboat is recognizable, just like a human face. If the lines are out of proportion, it will be noticable. So start with a very light, but correct drawing. Then loosen it up in the painting! 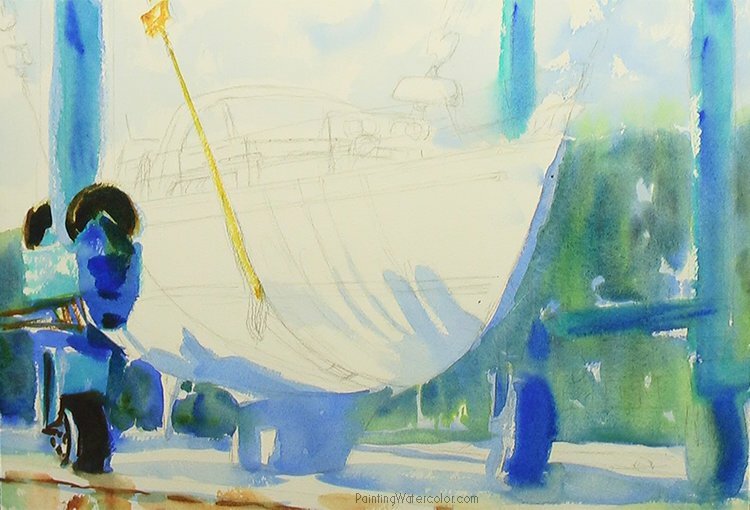 I begin with a bold wash of ultramarine blue and cobalt blue in all the shadows. I vary the pigments, using more cobalt in the sky and background and more ultramarine in the foreground shadows. I paint the sky very loosely and I don't plan on going back into it much. It's a background, not a focal point so I don't want much texture or interest in the sky. While this is wet, I drop azo yellow and a few dots of ultramarine into the background trees. Still working wet, I continue roughly painting the background. It's dried a little bit, so some drybrush texture shows up, some blurs. Exactly right. 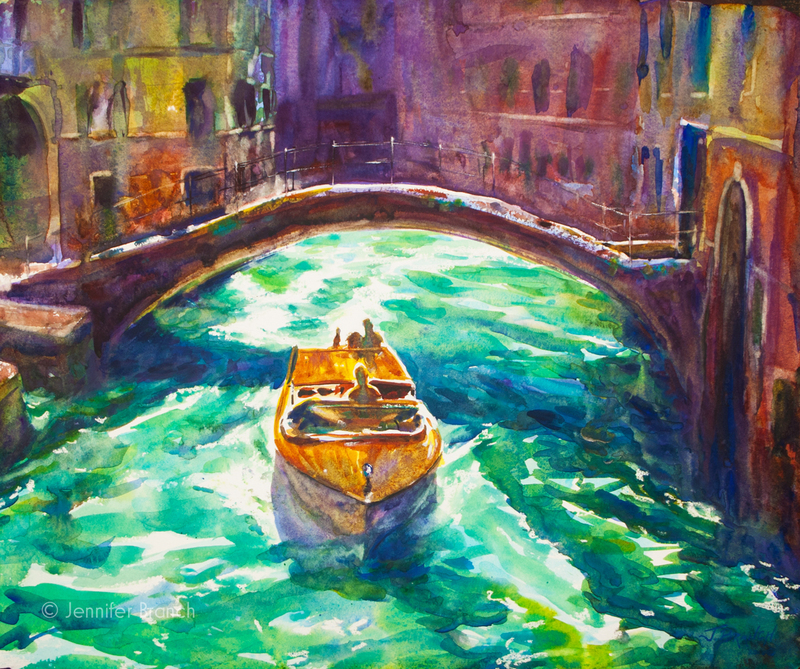 I use cobalt, ultramarine and cobalt teal for the girders holding the pulley system. I start painting the darks of the wheels and winches with burnt sienna and ultramarine blue. Now that the painting has dried completely, I can start adding texture. I drybrush some of the rough surfaces on the hull with nickel azo yellow. Paint twice as dark as you think you need. It will dry lighter! 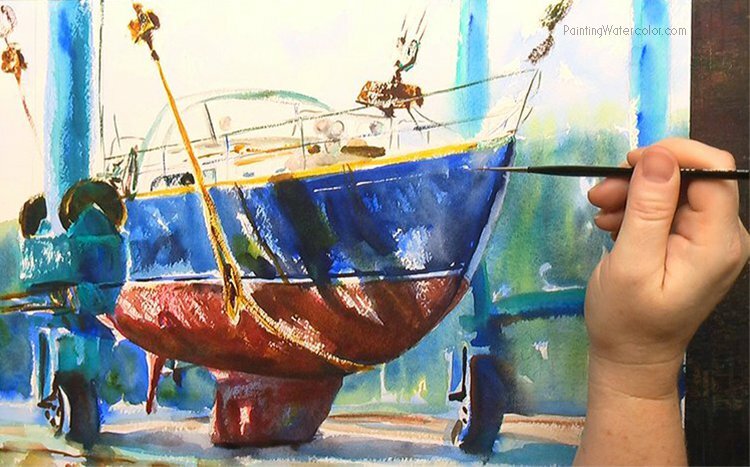 I'm continuing scrabbling drybrush all over the boat hull. I want a lot of texture under the final layers. 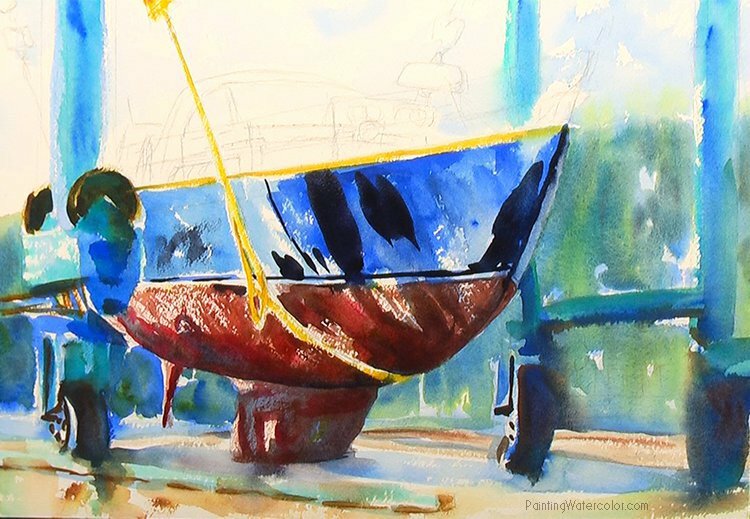 I start the deep shadows of the keel with maroon perylene. This bleeds into the shadow below. After the painting has dried again, I continue layers of drybrush on the hull. Notice how much lighter everything dried! Leave lots of white paper in the texture on your highlights. Remember to look at the colors that are really there, not just what you think they are. Always move your brush with the shape of the object you're painting. This is especially noticable in drybrush. After this has dried a little bit, it's time to start the real painting! 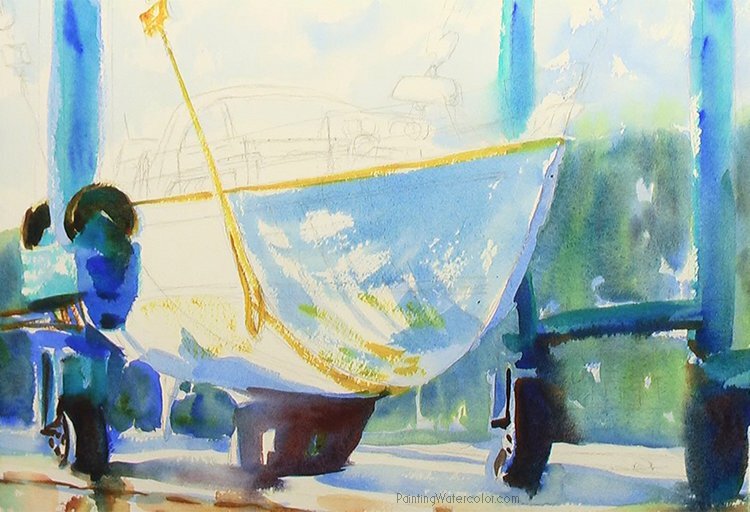 The focus of this painting is the beautiful shadows on the sailboat hull. I don't want to paint much detail outside that area. 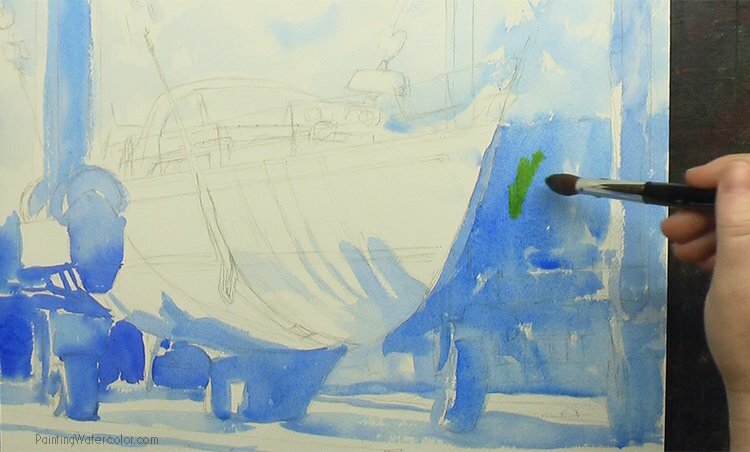 I start some dark ultramarine blue and burnt sienna slashes of shadow on the hull. 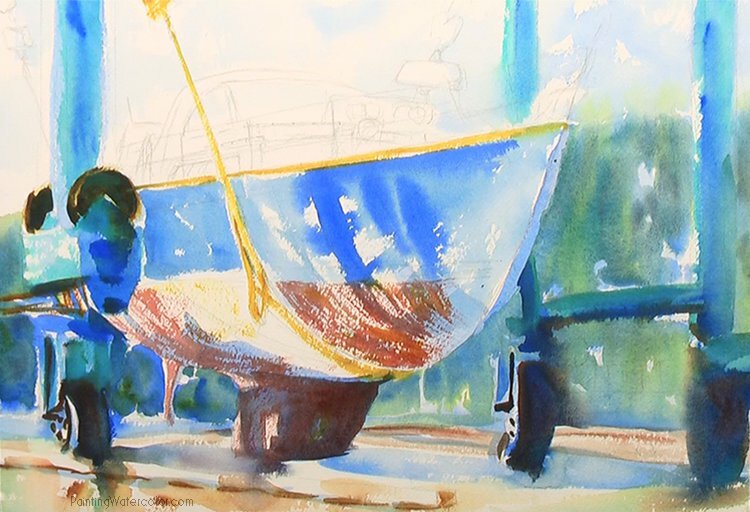 I paint the details of the boat deck with a big brush, very dry. I want them to sparkle and haze out. 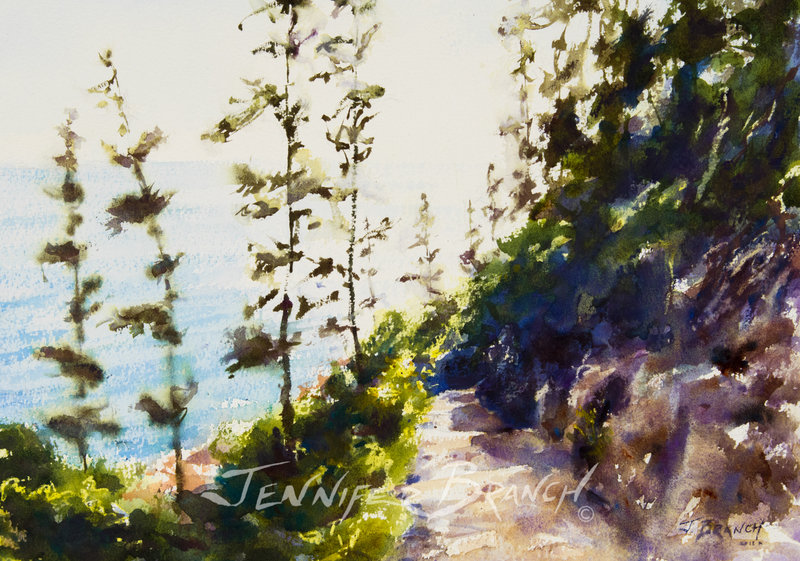 At the very last, I pull out a few details and highlights in white gouache, right out of the tube. I paint the trim line with a rigger, making a few dashes for the Hinckley insignia. The railings lost a little of their sparkle, so I drybrush gouache over them. 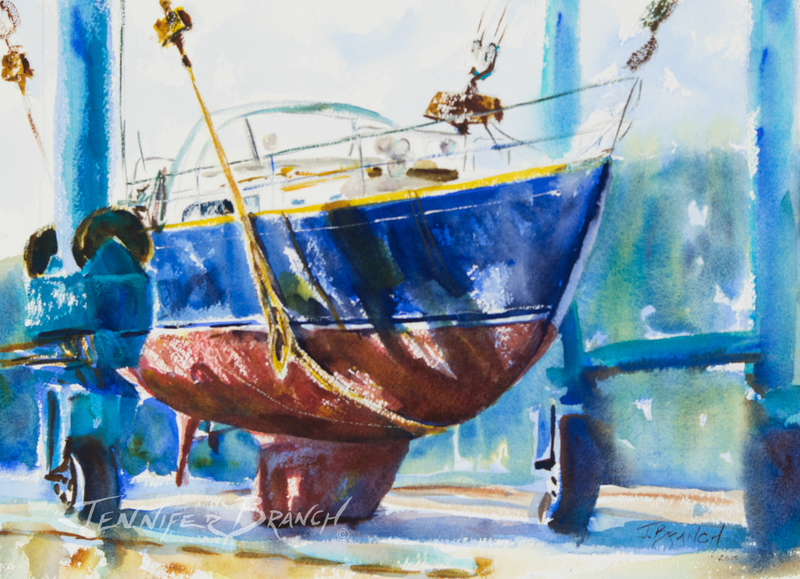 To purchase Hinckley Boatyard original watercolor painting, please click! 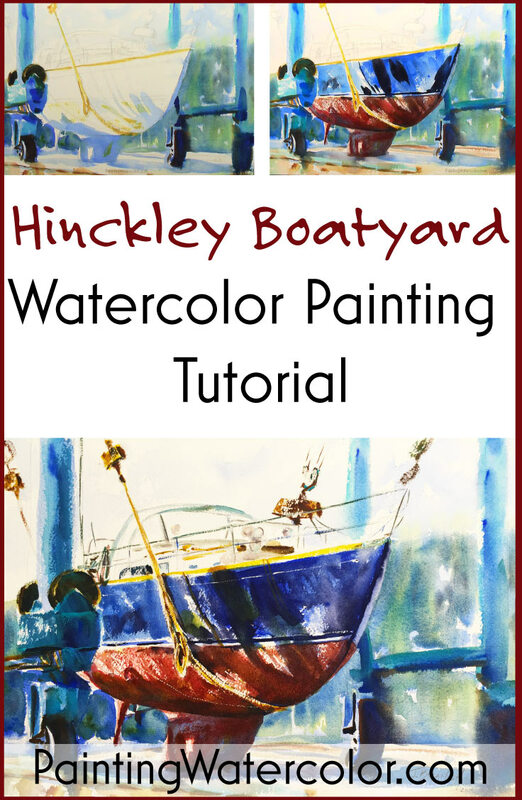 Hinckley Boatyard Final Watercolor Painting! I particularly like how the pulleys are just enough to tell what they are, the girders are just enough. The structure I need to define the painting is there but not distracting. The shadows on the hull are wet blurs on top of drybrush texture. A lot of depth. Navy is always a very difficult color to paint. Any highlights and it looks purple or green, not rich navy. I took a slightly different approach here than I usually do and it turned out. It's always worth trying something a little different. 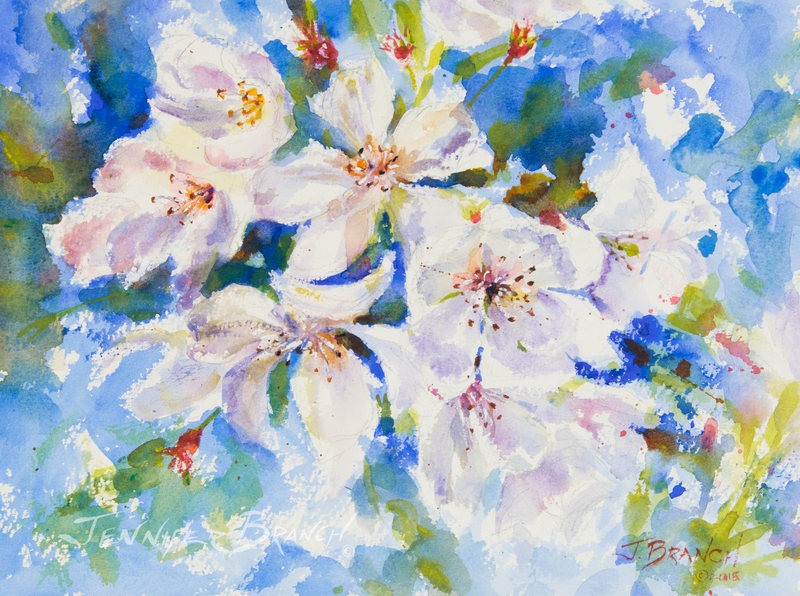 Only paint and paper, after all!